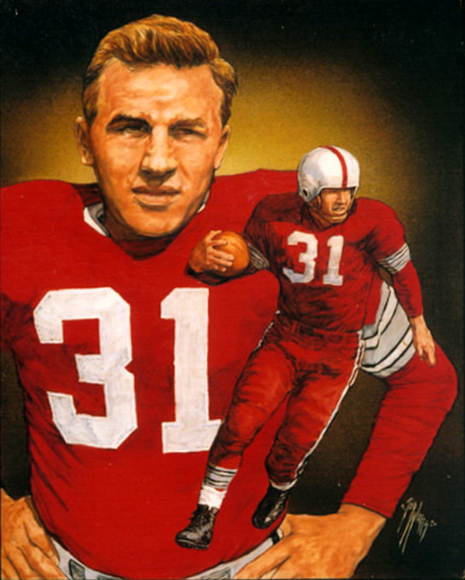 Invaluable as a defensive player, he was the key factor in the Buckeyes' success in 1950. He was the third junior to win the Heisman Trophy. The late Woody Hayes, the venerable Ohio State coach, had this to say about Vic. "He was not only a great runner, but also passed, was a place kicker and punter, played safety on defense and was an outstanding blocker. Janowicz epitomized the triple-threat football player." After a stint in the service, Janowicz signed with the Pittsburgh Pirates as a catcher for 1953 and '54. He returned to football in '54 with the Redskins and played defensive back. In 1955, he led the NFL in scoring until the final day of the season when Doak Walker beat him out. A near fatal automobile accident ended his football career in 1956. Vic was an Administrative Assistant to the Auditor of the state of Ohio, Jim Petro. In 1991, the Columbus Downtown Quarterback Club honored him as "the greatest O.S.U. athlete in the past 50 years." He is also a member of the OSU, Elyria and Polish-American Hall of Fame. Vic passed away in February of 1996. Vic was elected to the National Football Foundation and College Hall of Fame in 1976. A true "Triple Threat", Vic Janowicz could run, pass and kick and did all three exceptionally well. He won in the East, Midwest and Far West, with the popular Kyle Rote winning the Southwest and Kentucky's colorful Parelli winning in the South. Janowicz was the first of two Heisman winners to play both professional football and major league baseball, the other being 1985 winner Bo Jackson. Janowicz played in the National Football League with the Washington Redskins and in baseball with the Pittsburgh Pirates. He was among the last players to perform without a facemask. Victor Janowicz was one of the greatest all-around stars in the history of football. He was a sophomore on the 1949 Ohio State team and played defensive back. In the Rose Bowl, January 2, 1950, he intercepted two passes, ran one back 41 yards, and helped Ohio State beat California 17-14. In 1950 he played both offense and defense, averaging 50 minutes a game. 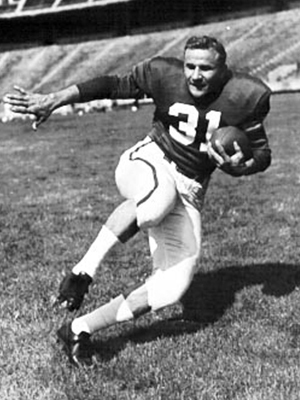 Wes Fesler, one of the last coaches to use the single- wing formation, put Janowicz at tailback, where he ran, passed, punted, blocked, and place-kicked. Janowicz threw four touchdown passes in a 41-7 victory over Pittsburgh. He made a 90-yard punt in a 48-0 victory over Minnesota. When the Buckeyes beat Iowa 83-21, Janowicz was responsible for 46 points. He ran for two touchdowns (one a 61-yard punt return), passed for four touchdowns, and kicked 10 extra points. He was unanimous All-America halfback and received the Heisman Trophy as the nation's best player. In 1951, Ohio State's new coach, Woody Hayes, installed the T formation, and Janowicz did not repeat as an All-America player. He kicked field goals that were the winning plays in victories over Northwestern 3-0 and Pittsburgh 16-14. Janowicz was in two post-season games, the East-West Shrine and the Hula Bowl. He won the Most Valuable Player Trophy in both. 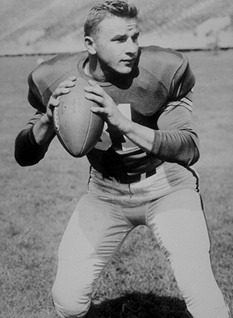 Janowicz played 81 games in major league baseball with the Pittsburgh Pirates 1953-54 and was with the Washington Redskins in the National Football League 1954-55. Injuries in an auto accident ended his athletic career. He became a businessman in Columbus, Ohio, a broadcaster, and a public speaker. His home town, Elyria, Ohio, named a baseball stadium in his honor. He became administrative assistant to the state auditor of Ohio, and in 1992 was honored at a banquet as "Ohio State's Greatest Athlete of the Last 50 Years. He was born February 26, 1930, in Elyria, Ohio; he died February 27, 1996.